Netflix has launched a new, four-part TV series based on the best-selling, James Beard Award-winning book, "Salt, Fat, Acid, Heat," by Samin Nosrat, right. She subscribes to the idea that those four elements are essential to any good dish. Already binge-watched the newest season of "Chef's Table?" All caught up on "The Great British Baking Show"? 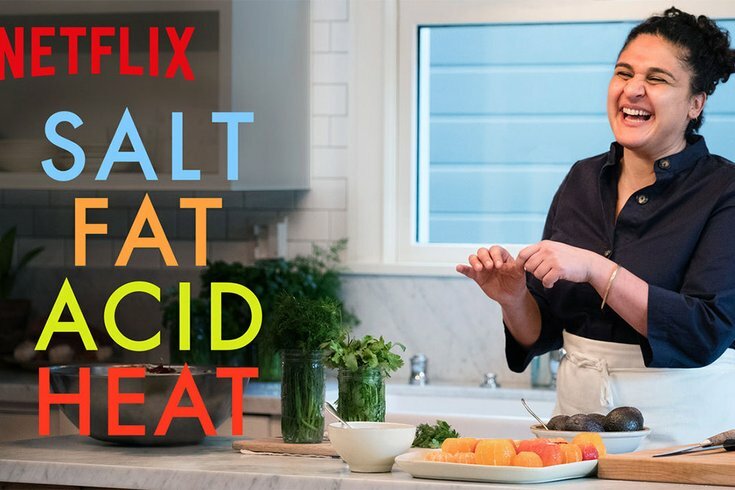 Well, today, Netflix dropped a new a four-part TV series based on Samin Nosrat’s best-selling, James Beard Award-winning book "Salt, Fat, Acid, Heat." You're going to want to go home and watch the show, which has the same name as the book, immediately. Check out the trailer, below, for yourself. In the trailer, Nosrat states "Good cooking is within reach of everyone." Her cookbook has become a kitchen essential because it's so useful to have around. The whole idea is that four elements (salt, fat, acid, heat) are essential to any good dish, so master those and you've made something good. Just like the book, Netflix's first how-to cooking show is a resource for home cooks. Norsrat doesn't talk directly to the camera à la Julia Child, but she does demonstrate her technique and teach her recipes to real people on screen. The show also does a good job of giving viewers travel-envy. The episode "Salt" takes place in Japan, "Fat" takes place in Italy, "Acid" takes place in Mexico and "Heat" takes place in Berkeley, California. "What I didn't see, and what I didn't understand why I didn’t see, was why there couldn't be something that was beautiful and cinematic yet accessible," Norsrat said in an interview with Bon Appétit.